Do you know where the expressions "Uncle Sam" and "Old Glory" come from? I had never even thought about how either one got started until recently when I visited in the home of Juanita (Finley) Swack in Cookeville. The explanations for these two well-known phrases will be told as this story unfolds, but first, I must acquaint my readers with this very unique lady. I knew after suggesting to her that I needed to do a story about her that I had my work cut out for me. You see, Juanita Swack is what I would consider quite a remarkable lady. She has not only been a wife, a mother of four children, but she is an exceptional homemaker as well as an extremely talented seamstress. Over the course of her life, she has made clothes for her family, has quilted many beautiful handmade quilts, many of the patterns for which she designed herself, and she has crafted dolls and teddy bears. Sewing for lots of families in Cookeville has also been included in this very busy lady’s life. Juanita Swack was born on January 9, 1919, the seventh child in a family of nine children. Her parents were William Cannon Finley and Maggie (Lee) Finley. Juanita’s mother, Maggie, was the daughter of Joe Lee, the creator of the Buckeye Family. Beaver Hill, Tennessee, in Overton County, was the place where Juanita was born and grew up. Her grandmother taught her to sew when she was only six years old, and she’s been sewing ever since. As a small child, she walked to a little one-room school called Pond Ridge, and later, when attending high school at Rickman, she and other neighborhood children caught a ride with a fellow who had built benches on the bed of his truck he used to haul riders to school in. One of the ways Juanita remembers getting money to pay for her ride to school was by picking peas on the halves. 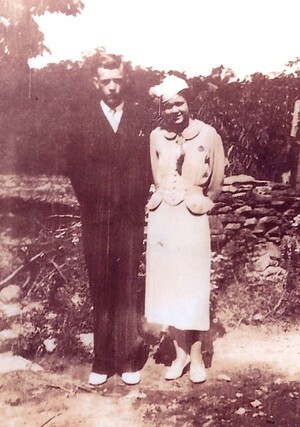 On October 22, 1936, Juanita and her beau, Bascum Swack, slipped off together and came to Livingston where Bascum gave Juanita money to buy a dress and accessories she wore later that day when they were married. The dress, hat and shoes came to a grand total of $11.00. The purchase was made at a dry goods store on the square in Livingston, and it was in that store that Juanita changed into the very fashionable dress she wore for the marriage ceremony. Bascum had purchased his suit earlier in the year from Sears and Roebuck for $10.00. The newly weds lived with his parents the first year of their married life, and a little later, bought the a farm in the Rickman area for $500.00. They lived there for a while and then moved to Indiana where Bascum took a job building houses that paid wages at the rate of thirty cents an hour. Later he got a job working in a powder plant in Louisville, Kentucky. World War II was declared while the Swacks were living in Louisville, and after moving back to the farm in Tennessee, Bascum was called into service. He left the same day he went to be examined for military duty. While in the army, he served in the Philippines and in Japan. Life was not easy for Juanita while Bascum was in service. She was expecting their third child during this time. Their home had no electricity or running water. Water had to be carried from a cave on their farm, and the wash was done by hand on a rub board. There was no telephone and the family did not have a car. Cattle had to be tended to, firewood had to be cut for cooking purposes as well as to heat their home. Bascum returned home from service, and in 1955, the family moved to Cookeville. After moving to Cookeville, Bascum began building homes in that area, and Juanita’s sewing skills kept her busy making clothes, and often, she made a wedding dresses as well as all the bride’s maids dresses for a wedding party. When the Bicentennial Year came around, Juanita decided she would make a special quilt to honor our nation’s 200th birthday celebration. In preparation for the making of this quilt, she did some research into the history of our country, but could not find the answers she was looking for. After asking everyone she thought could help with the question of where did the phrases "Uncle Sam" and "Old Glory" come from, but not finding the answers, she sat down and wrote to Senator Howard Baker in Washington to see if he could provide the answers. And it was Mr. Baker who supplied the information she worked so hard to find. It seems that during the War of 1812, there was a farmer in New York by the name of Samuel Wilson who provided meat which had been preserved in barrels that was used to help feed soldiers. It was because of Mr. Wilson’s help that he became known as "Uncle Sam", a name that was then attached to our government. And according to the information Juanita received from Senator Baker, a young sea captain, William Driver, was responsible for giving the flag the name "Old Glory" in the year 1831. He was placed in command of The Charles Daggett, and twice, he took the flag with him while sailing around the world . In 1837, he retired from the sea and took Old Glory to Nashville with him. During the War Between The States, Driver hid the flag from Confederate troops by having it sewn inside a quilt. In 1862 Union troops took Nashville, and Captain Driver brought the flag out of hiding and raised it over the State Capital. Captain Driver’s Old Glory was given to the Smithsonian Institute in Washington, D.C. in 1922. 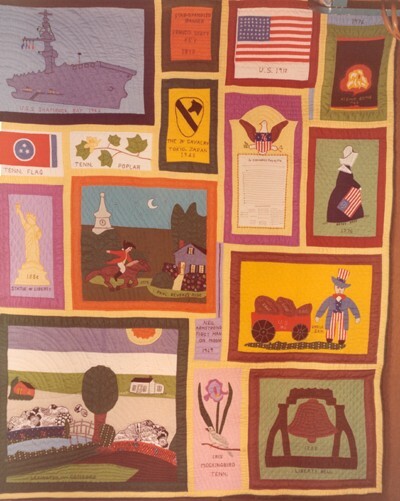 Many hours and much work went into the making of the Bicentennial Quilt, including some sleepless nights Juanita had as she law awake planning what type of design to draw next for each block of this very special quilt. When it was finally completed, it was on display at the Cookeville branch of First National Bank of the Cumberlands, and later, Juanita took it to several home demonstration clubs to be shown during their meetings. Along with the quilt, she crafted two large dolls, one made in the likeness of Uncle Sam and the other as Betsy Ross. Teddy bears have been and continue to be one of Juanita’s favorite things to make. She has made each of her grandchildren a bear that is quite special since the fabric used was an old blanket that belonged to Bascum’s Aunt Betty Boswell. Mrs. Boswell raised the sheep that the blanket was made from. She sheered the wool, made the thread, and wove the blanket, all of this taking place during the year 1912. Now each grandchild has a little bit of family history in that special teddy bear that was made especially for each one by their grandmother Juanita. Juanita has also used her sewing skills in ways to help the less fortunate. Many items she made by hand were given to victims of the most recent tornado that did a lot of destruction in Byrdstown a few years ago. A quilt, two feather pillows, a baby quilt and several dresses for little girls were included in the items she donated. Since then, many little girls who attend Midway Baptist Church in Cookeville where Juanita is a member have also received a beautiful little dress all made by her skilled hands, something she says has been one of the most enjoyable things she’s ever done. 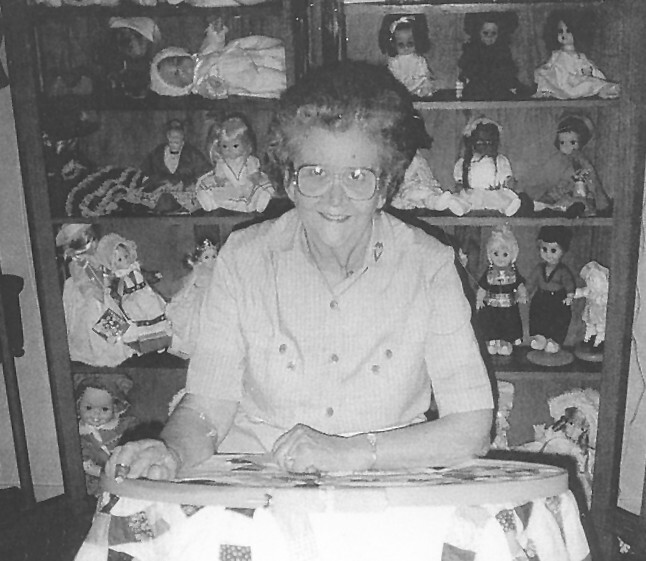 Up until last year, Juanita had a doll collection that included 175 dolls. She decided then it was time that she divide the dolls up among her children and let them have new homes for a while. Many of the dolls in her collection had clothes she made by hand especially for them. But if she excels in sewing, her cooking skills rate very high on her list of things she does well too. One the day I visited in her home to gather information for this story, she had a box filled with homemade fried apple pies for me to take home that evening. Um, Um, Good doesn’t begin to describe how delicious they were. She told me she had made hundreds of these fried pies to give away, and only on one occasion has she ever taken any money for them. The crusts are never made from canned biscuit dough, but are all done completely from her special fried pie crust recipe. She still raises a garden, has canned 79 quarts of beans this year, has put other vegetables in the freezer, and has dried lots of apples for those wonderful fried pies. Bascum’s favorite kind of pie he liked for Juanita to make especially for him was rhubarb. In the early 1990's, Bascum’s health began to fail, and in 1995, Juanita also was faced with a life threatening illness, and because she was no longer able to care for her husband at home, he moved into a nursing facility. One year when gardening time came round, Bascum told Juanita she should plant some rhubarb. Several years before, Bascum had set out a rhubarb plant near a pecan tree in their yard. The tree had grown into quite a large tree, but there had been no sign of the rhubarb for several years, so Juanita assumed it had just died out. One day her son, Howard, was trimming around the pecan tree, and he came to the house to ask his mother to come and look at this strange plant that was growing near the tree. She took one look and knew it was the rhubarb plant that Bascum had set out many years before. Howard, after learning what the plant was, decided to move it to a better place. Juanita told Bascum about their discovery, and also told him that as soon as the plant got big enough, she would make him a rhubarb pie. The rhubarb did well in its new location, and soon it was big enough to make Bascum a pie. He enjoyed that pie very much, so after a while, Juanita made a second one. That one too was as delicious as the first, but after a third one, Bascum told Juanita that was enough, he didn’t think he would want anymore. Just a few days later, Bascum’s health began to decline rapidly. At the same time, Juanita noticed that the rhubarb plant had wilted badly, with all but one leaf lying on the ground. Following Bascum’s death a few days later, the one leaf that had been standing on the rhubarb plant also died, and it has never come up since. Juanita said, "God let it serve it’s purpose." Juanita and Bascum have raised four children, two girls, two boys, whose names are Nellie, James, Linda and Howard. Their family now includes six grandchildren and seven great-grandchildren. They are a close-knit and caring family, and it’s obvious that Juanita and Bascum couldn’t have been better parents. The Swack home is one where family as well as friends are often found visiting. Everywhere you look, flowers can be seen, outside in flower beds, also in containers and pots, and they too seem to know that love abounds in this home. Juanita will be 85 years old this coming January, and she says even though she has lived to this age, there is still much more she wants to do. A thought Juanita has for a good life goes like this: "Hands at work and heart to God. Love everyone, for love is a powerful word." But I think she summed it all up with these words, "You can have happiness for a little while and it passes. But if you have joy, it lasts, for it is peace of mind." Real joy is surely evident in the life of Juanita Swack, but also it can be found in the lives of others she has come into contact with along the way.